USNI author Captain Stephen J. Coughlin, who, as of January 2010, was commander of Patrol Coastal Squadron One, offers a very kind review of my October 2010 Proceedings essay, “Running on empty” in the current November issue of Proceedings. Captain Stephen J. Coughlin, U.S. Navy—Dr. Hooper has masterfully articulated a Fleet-wide concern that sometimes gets little attention when considering the Navy’s overall shipbuilding strategy. 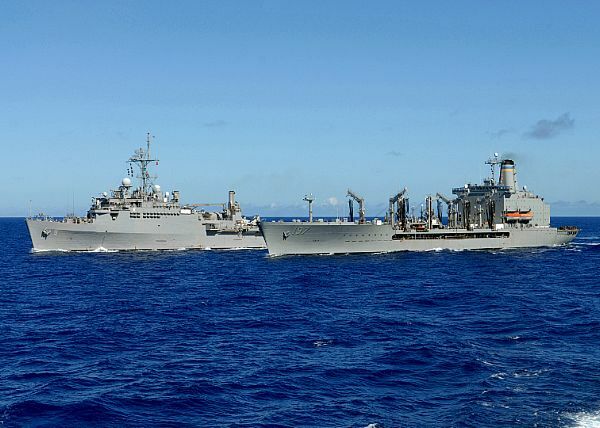 Our aging force of just 31 replenishment vessels may not share the limelight with our fast-running greyhounds, but any seagoing officer would agree that they are certainly the most fundamental elements of our surface force. And without new oilers very soon, it will get harder and harder to accomplish the increasing requirements for global presence and sea-control operations. With that in mind, the mounting emphasis on ballistic-missile-defense missions in multiple theaters where shooters will remain on alert for extended periods adds credence to the argument that we have a growing need for fleet oilers. To say that our current replenishment force is too small, too old, and too environmentally vulnerable really got my attention. Honestly, I did not know that these workhorses pumped over 710 million gallons of fuel to our warships last year and averaged more than six months of the year under way. That is some backbreaking work and I salute it. Like many of us who began our careers in the Cold War era, when the oilers were always guaranteed to be on station when needed, it is easy to take them for granted. So Dr. Hooper’s analysis and apprehension should serve as a wake-up call to Fleet planners. Also, I appreciate the other well-thought-out points that become worrisome if we do not have a better inventory of fleet oilers: no guarantee of host-nation resupply options in places where diplomacy hangs in the balance, the potential for skyrocketing shipbuilding costs if we do not leverage existing hull-commonality now, and the enormous liquid-fuel appetite for future electric-centric weapon systems. This in-depth scrutiny of the situation should cause trepidation and begs the question about where our priorities are. Finally, as I have advocated in the past, there is a place for small surface combatants in the U.S. Navy. Our Cyclone class is a testament to such ships, and for many reasons there is a growing body of naval strategists who believe that a follow-on class of corvettes should be considered. Those ships would multiply our sea-control capacity by an exponential order of magnitude at an affordable price. But there will be immense logistics requirements needed to support their unique tooth-to-tail ratio. That tail begins with a Fleet oiler class of considerable size and strength to support our expanding global influence. Dr. Hooper has enlightened us, and we should heed the call. Obviously, Captain Coughlin is a SWO who gets it, and I strongly suspect he is bound for great things in the future! Again, my sincere thanks to Captain Coughlin. In a world where some SWOs tend to give little credence (or-worse-heap scorn upon) a landsman like me, it feels great to get such a ringing affirmation from a tried-and-true ship driver. Your feedback means a lot, Captain. Seriously. Thanks. I read the article earlier and have about a page of notes to be tbe posted later this week. Unfortuately I was focused on your comments below the article above. CLF only continues because the Navy keeps the term in the budget lines and it get perpetuaed ad infinitum. Having worked on the introducation of three Kaisers plus about 10 other USNS ships to the MSC force, my perspectiveis more to those platforms. BTW the MPS are RAS capable and then there as the MSDS ships in the RRF with UNREP rigs. A very few SMS have minimal RAS rigs. The older Navy spec AORs were retired due to them being unreliable and too small. I hope that operational people are asking similar questions regarding their own plans. In some cases, they are, and bust their butts to make do. Some do not. On a strategic level, however, I fear there has been–until recently– a real disconnect, where leaders forget how stressed the COMBAT Logistics Force actually is. American Overseas Marine (or whoever) should build or modify ships so they are capable of conducting UNREP operatiions. We can buy gas from a commercial suppliers during peace time operations, convince ourselves we do not need to actually build the actual NFAF ships to support our operations because our day to day needs are getting met by those commercial ships operating in benign environments . . . so what happens when we go to war? The US does not have the ships it needs to conduct the operations beacuse we relied on commercial delivery . . . what if the commercial industry decides that it does not want to operate their ships within a certain range of the conflict and/or decides that they do not “support” that war from a political viewpoint? Mister Hooper seems to be a pretty smart guy. Given the necessary background experience, I could see how he could be an effective Navy “ops type” and/or “ops analysis” kind of guy on a real staff. Too bad he doesn’t have the background . . . Mere semantic piffle. I appreciate your comment, but you missed the point of the article; you certainly missed the second sentence of my paper, which states, “Operated by the Military Sealift Command, the 31 replenishment ships of the Naval Fleet Auxiliary Force spent 5,036 days at sea during the last fiscal year…” The article is about oilers, not the entire MSC. Regarding the other three MSC programs, there isn’t a whole lot of alongside refueling-ready platforms in the MSC Special Mission, Sealift or Prepositioning Program inventory. There are some, but I address that in the paper. You might have missed the reference. Regarding the NDRF, there is, as of July 2010, exactly one tanker in retention status. There are twenty six in non-retention–i.e. bound for a scrapper, sinkex or reef near you. Again, this was briefly mentioned, but you may have missed it. I encourage you to read the paper again, and I will be glad to answer your questions! Your article refers to the “Combat Logistics Force” which has not actually existed for some time. Do you mean the MSC Naval Fleet Auxiliary Force? NFAF is only one part of MSC, so don’t forget the other three, and then there is also the NDRF Ready Reserve Force. I think you forgot something like 75 ships, and used a years old program name for the ones you did know about.